New York: Armchair Detective Library, 1994. 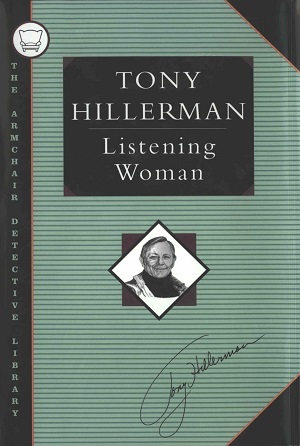 In 1994, the Armchair Detective Library, a division of Otto Penzler Books, published three runs of Tony Hillerman's 1978 novel Listening Woman. This edition, with a green striped dust jacket, black cloth covered boards, and with gold embossing on the spine, is an example of the trade edition, replete with a new introduction to the novel written by Hillerman himself. At the center of the front cover of the dust jacket is an inset on-the-bias drawing of Hillerman, and Hillerman's autograph is reproduced in the bottom right corner. Binding: Black cloth covered boards with gold embossing on spine, which includes a linear framing device, a decorative emblem seen in the title page, TONY HILLERMAN Listening Woman read horizontally, and the publisher's device to be read vertically, or perpendicular to the spine's lettering, at the bottom of the spine.